Every home owner wants a beautiful backyard to enjoy, but not every home owner has the time to maintain it. Mowing, weeding, clipping, raking, and other backyard tasks may just be too much to take care of—and that’s OK. If you prefer to avoid backyard maintenance, there’s hope for your lawn. We have 19 tips, ideas, and options for creating a comfortable, beautiful outdoor living space that doesn’t require hours every weekend to keep it looking nice, and can help you save water, too. Pave it: For many backyards, the simplest solution for low maintenance landscaping is to simply pave some or even all of the yard with hardscaping. It may be painful to do away with a lush, green lawn in favor of pavement, but consider this: you’ll have ample room for a lovely outdoor entertaining space with your new large patio. You can install raised beds with small plants for color and life, and use the rest of the area for outdoor recreation and play zones. Think: fire pit, outdoor seating, paths, even a sand pit. Reduce your lawn size: Not ready to go all the way? Consider creating zones in your backyard, with some paved, some with alternative covers or beds, and the rest with grass. You’ll still have less to maintain with a smaller lawn. Choose drought tolerant plants: High maintenance flowers, shrubs, and other plants mean you’ll have to spend lots of time watering, trimming, and paying attention to them. 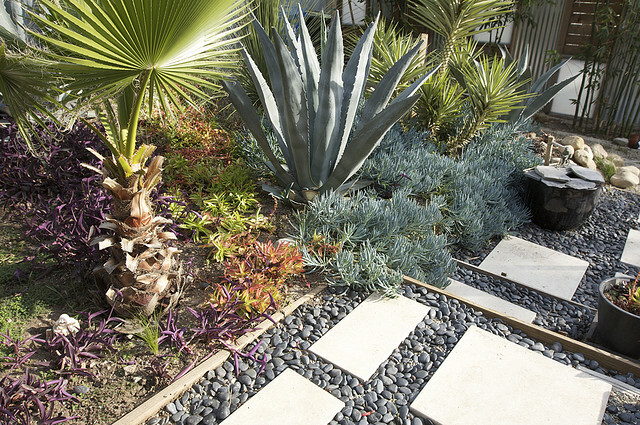 Instead, choose drought tolerant plants that are happy to be left alone, particularly cacti and succulents. While they do need occasional water and trimming, for the most part, they’ll thrive with little to no attention at all. Choose plants suited for your local climate: With plants that do better in other climates, you’ll be fighting an uphill battle of watering, trimming, and maintenance, but if you choose native plants that are adapted to your region’s climate, you’ll have a much easier time maintaining them. Consider whether your climate is humid, moderate, arid, or another type, and be sure to pick plants that do well in your climate. Plant a slow growing grass: Hate to mow your lawn? Choose a grass that doesn’t need to be mowed weekly. Consider slow growing grass varieties such as Zoysia, Bermuda, St. Augustine, or Bahia. These grasses are typically drought tolerant and will grow slower than other varieties, so they require less mowing and attention from you. Avoid overgrown pathways: Stepping stones may leave plenty of open dirt and grass area for weeds to grow. Instead, create a path with decomposed granite and large stones where weed growth will be discouraged and you can enjoy clean lines. Be sure to start with an underlayment of mesh to further discourage growth. Plant evergreens and perennials: Some home owners get excited about planting new color every season, particularly in the springtime. But if you’d rather set it and forget it, there are plants for you, too. Evergreens and perennials are good choices for those who don’t want to plant and replant often. With evergreens, you’ll have foliage that looks nice all year round, and perennials will bloom annually without needing to be replanted every season. Consider an alternative material cover: If grass maintenance is just too much for you, but you’re not ready to commit to a full paving of your backyard, consider an alternative cover. Decomposed granite or artificial turf make good choices. Artificial turf is particularly exciting these days, as it’s come a long way and provides a strong alternative to real grass. Decomposed granite has a more natural feel, but has practically zero maintenance. You’ll simply need to rake it back into place occasionally and replenish it every few years. Install a sun shade: Protect your patio area from leaf debris, bird droppings, and environmental wear with a sun shade. You’ll take it easier on your patio furniture, outdoor toys, and other items stored outside. Decorate with stones: Never underestimate the low maintenance beauty of stones. You won’t need to water them, but simply arrange them and go. They can be placed in beds, used as barriers, or artfully arranged as a rock sculpture. No watering or weeding needed. Create an alternative garden: Instead of planting a garden, consider creating an alternative collection with outdoor decor, yard fillers, or rocks. Don’t forget to mulch: Mulching is an extra step in backyard maintenance, but it’s an important one. Use organic mulch like wood chips or leaves to regulate the soil temperature, retain moisture, and add nutrients back into the soil. Landscape with your pool in mind: If you have a pool in your backyard, be sure to take it into consideration when landscaping. As a large, open area that’s prone to gathering leaves and other debris, it’s smart to landscape so that you’ll have minimal droppings in your pool. Choose trees and plants that tend to keep their foliage rather than shed it. Think palm trees instead of pine trees and leafy bushes instead of flowering shrubs. Choose ground cover instead of grass: Ground cover like moss or clover can be a great alternative to grass for your backyard, and often require little to no maintenance. Use organic fertilizers—or not at all: Adding chemicals to your lawn can disrupt the delicate natural balance of nutrients and promote lawn disease. Consider using organic fertilizer, or simply use compost or organic matter to promote a better lawn. It’s also smart to use natural pest control and herbicides. Choose durable outdoor furnishings: Your backyard may be an extension of your living space, but it’s still outside. When choosing backyard furniture, look for durable items that can stand up to weather, sun, and outdoor debris. Wicker, for example, doesn’t weather well, but plastic, metal, and teak wood will hold up much better. Xeriscape: You can greatly reduce your water costs and maintenance needs by changing your landscape to a xeriscape. You’ll use native, drought resistant plants, rocks, and other landscape design elements to create a beautiful area that requires little upkeep. Often, xeriscaping involves using cacti and succulents, and can include flowering drought resistant plants as well. Plant an edible garden: Want to have plants in your yard? Make them serve a purpose. Choose plants that can be eaten, but also look great. Often, greens, peppers, and fruit trees are pleasing to the eye, but can also yield an excellent crop for you to eat. Be smart about bedding: Instead of using natural bedding materials like pine needles, which require weeding, consider using stones or gravel instead, as they provide better cover and discourage weed growth. You’ll end up trimming less and enjoy crisper borders.